Cardiff and Vale UHB is thrilled to announce that Ysgol y Ddraig in Llantwit Major will be the eighth school in the Vale of Glamorgan to achieve a National Quality Award. Years of hard work have paid off today as the staff and pupils of Ysgol y Ddraig were presented with the prestigious Welsh Network of Healthy School Schemes’ National Quality Award (NQA). The school is part of the Vale of Glamorgan Healthy Schools Scheme, which is now in its seventeenth year, and has worked tirelessly to achieve the highest level of recognition within it. By doing so, a school must progress through 5 different phases before applying for the award. In Phases 1-3 a school is required to plan and implement three specific health actions over the course of one academic year. In Phases 4-5 a school is required to work towards achieving a whole school approach to one of the Healthy Schools topic areas over the course of two academic years. Following this, the NQA is awarded to schools that can demonstrate a whole school approach to all areas of health listed within the Healthy Schools Scheme. This requires a school to collate evidence for each of the indicators listed in the NQA documentation. The NQA is a prestigious award for any school to achieve, and is assessed by national assessors. To date, seven schools in the Vale have achieved this award; Barry Island Primary, Cadoxton Primary, Gladstone Primary, Llangan Primary, Jenner Park Primary, Cogan Nursery School and Llantwit Major Comprehensive school. The award was presented to the pupil school council along with Ysgol y Ddraig’s head boy and head girl. Upon receipt, they gave a presentation on the work that they put into the award, including promoting active travel, litter picking and reducing waste, establishing a food and fitness group, designing no smoking posters, conducting a survey on school meal options, running a fair-trade fortnight in the school, increasing awareness of children’s rights in school, and even reading and discussing Welsh Government consultation documents! 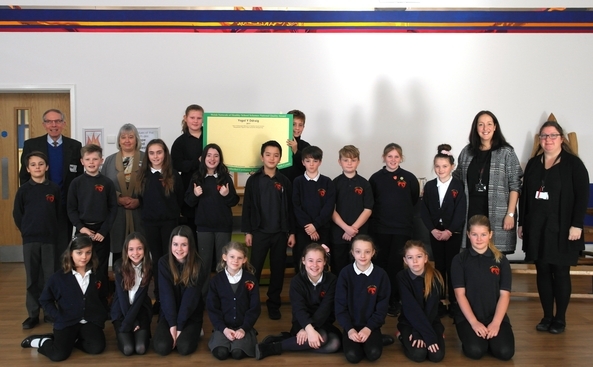 The pupil voice in Ysgol y Ddraig is so strong that when Eagleswell Primary and Llanilltud Fawr Primary were amalgamated into the new school, the pupils contributed to the design of the new school name, motto, school badge, uniform and building. This is something that seriously impressed the NQA assessors, who visited the school last November, and was mentioned explicitly in their highlights of the school. In fact, the pupils of Ysgol y Ddraig are so committed to being a healthy school that they’re not resting on their laurels. 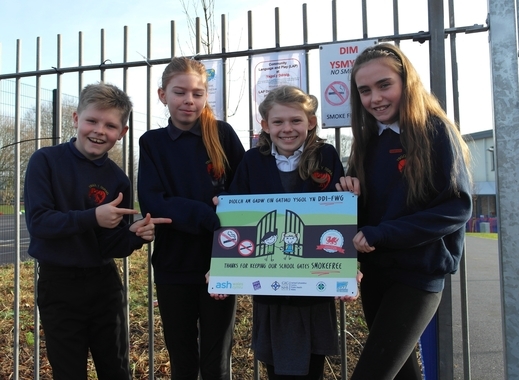 The same day as the school received the award, they put up a plaque from Public Health Wales and ASH Wales, to clearly communicate to the whole school community that their smoke free policy, including the use of e-cigarettes, is extended to their school gates.